All cells, including tumor cells and non-malignant cells, shed DNA, called cell-free DNA (cfDNA), into the circulatory system (Diaz and Bardelli 2014). Cancer and other conditions, such as renal failure and myocardial infarction, often result in higher levels of cfDNA than in healthy patients (Diaz and Bardelli 2014). Circulating tumor DNA (ctDNA) is cfDNA that is shed from tumor cells into the circulatory system (Figure 1). 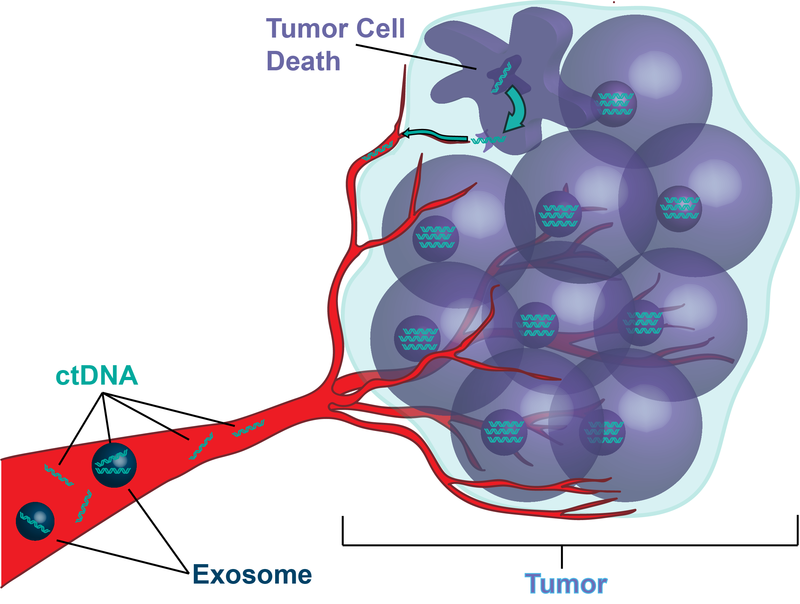 The mechanisms whereby tumor cells release DNA into the blood are not well understood; DNA may enter the bloodstream via secretion from viable tumor cells as either free DNA or in cell-derived vesicles known as exosomes (Figure 1), via secretion from phagocytes post-engulfment of tumor cells, or as a result of tumor cell death through necrosis and apoptosis (Aarthy et al. 2015; Chaudhuri et al. 2015; Diaz and Bardelli 2014; Ignatiadis, Lee, and Jeffrey 2015; Polivka, Pesta, and Janku 2015). Once in the bloodstream, the DNA persists only for a short time (t1/2 of ~2 hours) (Diaz and Bardelli 2014; Diehl et al. 2008). Most cfDNA and ctDNA are between 180-200 base pairs (bp) in length (Diaz and Bardelli 2014; Diehl et al. 2005; Diehl et al. 2008; Fan et al. 2008; Jahr et al. 2001; Mouliere et al. 2011). ctDNA can be distinguished from other cfDNA by the presence of somatic mutations, but in the case of solid malignancies ctDNA makes up only a small fraction (often only <1%)(Diehl et al. 2005; Diehl et al. 2008; Holdhoff et al. 2009); in hematological malignancies (e.g., leukemia), on the other hand, the blood contains much higher percentages of cfDNA derived from cancer cells. The contributing fraction of ctDNA to the total cfDNA increases with increasing tumor burden (Diaz and Bardelli 2014; Diehl et al. 2008; Newman et al. 2014) and, as such, the amount recovered may vary greatly among patients. Figure 1. Some tumors can secrete small fragments of DNA, called circulating tumor DNA (ctDNA), into the circulation where they are found in plasma. A “liquid biopsy” using blood samples obtained from cancer patients can be performed to detect ctDNA and to identify specific mutations in the ctDNA that may have prognostic and/or therapeutic implications. Molecular profiling of tumor DNA has traditionally been performed on samples obtained from a tumor biopsy or a surgical resection sample. The extraction ofctDNA from blood samples obtained from cancer patients for analysis of tumor DNA is referred to as a “liquid biopsy” and has less pain and is less invasive than a standard tissue biopsy procedure (Haber and Velculescu 2014; Overman et al. 2013; Figure 2). Given these advantages, as more studies are reported demonstrating the correlation between mutations in tumor tissue and ctDNA, ctDNA may have an increasing utility in the clinical setting for the investigation of solid tumors as a diagnostic and prognostic tool (Aarthy et al. 2015; Chaudhuri et al. 2015; Diaz and Bardelli 2014; Ignatiadis, Lee, and Jeffrey 2015; Jovelet et al. 2016; Polivka, Pesta, and Janku 2015). Because tumors are temporally and spatially heterogeneous (Gerlinger et al. 2012; Hiley et al. 2014; Ichihara and Lovly 2015; Nik-Zainal et al. 2012; Piotrowska et al. 2015; Wang et al. 2014), a tissue biopsy may only give a “snapshot” of one portion of one tumor at one time. Considering that blood collection is easier than a tissue biopsy, and the fact that ctDNA likely derives from all tumor sites, liquid biopsy has the potential to more accurately monitor a patient’s disease burden and progression in real time by allowing detection of DNA characterizing intra-tumor and inter-tumor heterogeneity (Aarthy et al. 2015; Chaudhuri et al. 2015; Diaz and Bardelli 2014; Ichihara and Lovly 2015; Ignatiadis, Lee, and Jeffrey 2015; Piotrowska et al. 2015; Polivka, Pesta, and Janku 2015). Further, ctDNA has been detected in a number of other bodily fluids, such as urine, stool, cerebrospinal fluid, and saliva; so ctDNA testing may involve tumor monitoring utilizing these sample sources as well (Patel and Tsui 2015). Figure 2. 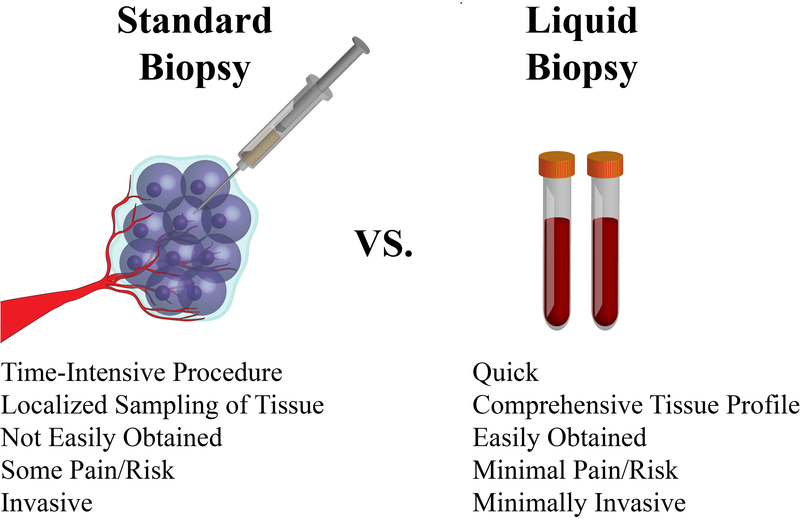 Collection of ctDNA as a “liquid biopsy” has several potential advantages over standard biopsy. ctDNA has been used as a biomarker in an increasing number of cancer types, including lymphoma, melanoma, GIST, thyroid cancer, breast cancer, colon, and lung cancer monitoring for common mutations, (e.g., those found in BRAF, EGFR , KRAS, PIK3CA, TP53, KIT, PDGFRA, and ESR1), and has informed prognosis and treatment decisions (Gonzalez-Cao et al. 2015; Kang et al. 2015; Lubitz et al. 2016; Piotrowska et al. 2015; Roschewski et al. 2015; Schiavon et al. 2015; Sefrioui et al. 2015; Spindler et al. 2015; Xu et al. 2015; Yoo et al. 2014). As a result of these promising initial studies, ctDNA analysis is now being incorporated into several ongoing clinical trials (reviewed in Polivka et al. 2015). ctDNA analysis is likely to be useful for tumor molecular profiling as it has several potential advantages over traditional tumor biopsy (discussed above; Figure 2). It is possible that ctDNA analysis will be used to monitor tumors over time in response targeted therapeutics, to monitor the development of resistance, and for the detection of minimal residual disease (Arnedos et al. 2015; Bordi et al. 2015; Diaz and Bardelli 2014; Garcia-Murillas et al. 2015;Saliou et al. 2015; Siravegna et al. 2015; Yoo et al. 2014). Further, the amount and type of ctDNA recovered may be indicative of tumor stage and burden (Diaz and Bardelli 2014; Ocana et al. 2015; Saliou et al. 2015), and thus potentially used for tumor staging. Further, in addition to gene specific mutation detection, ctDNA has been used to detect other tumor-specific genetic alterations, including microsatellite instability, loss of heterozygosity, and epigenetic changes (Aarthy et al. 2015). Importantly, ctDNA may be one day be used in cancer screening and for early detection of disease (Amant et al. 2015; Bianchi et al. 2015). Because ctDNA from solid malignancies comprises only a minor fraction of the total cfDNA, detection techniques for ctDNA must be highly sensitive. The most common detection methods for ctDNA include massively parallel sequencing or next-generation sequencing (NGS)-based assays and digital PCR (dPCR) (Chaudhuri et al. 2015; Ignatiadis, Lee, and Jeffrey 2015). NGS-based assays may be targeted gene specific panels or may be larger ,whole exome- or genome-based studies similar to NGS techniques used on tumor biopsy DNA specimens. The two primary methods for dPCR include the use of beads, emulsion, amplification, and magnetics (BEAMing) and droplet digital PCR (ddPCR), both of which separate template molecules into thousands of tiny droplets, each containing one template molecule (Chaudhuri et al. 2015). These methods are paired with allele-specific PCR to probe for tumor-specific, clinically actionable genomic targets with precise quantification of the percentage of template molecules containing the targeted mutation and sensitivity levels of ~0.01% (Chaudhuri et al. 2015). However, while dPCR techniques offer a high level of sensitivity and specificity and quick turn-around times, they are limited by the number of mutations that may be probed at one time. In contrast, NGS can interrogate multiple mutations in parallel. Novel methods are being developed that take advantage of the benefits of NGS while retaining the sensitivity of dPCR (Newman et al. 2014; Spellman and Gray 2014). As detection techniques continue to improve, the utility of ctDNA analysis as a diagnostic and prognostic tool will likely translate into routine clinical care. Contributors: Christine M. Lovly, M.D., Ph.D., Michael F. Berger, Ph.D., Cindy L. Vnencak-Jones, Ph.D. Suggested Citation: Lovly, C., M. Berger, C. Vnencak-Jones. 2016. Circulating Tumor DNA. My Cancer Genome https://www.mycancergenome.org/content/molecular-medicine/circulating-tumor-dna/ (Updated February 8).